It's from the afternoon workshop at Newport 24/7/1965. How do I know this was performed first and not later or much earlier? Simple bit of detective work. 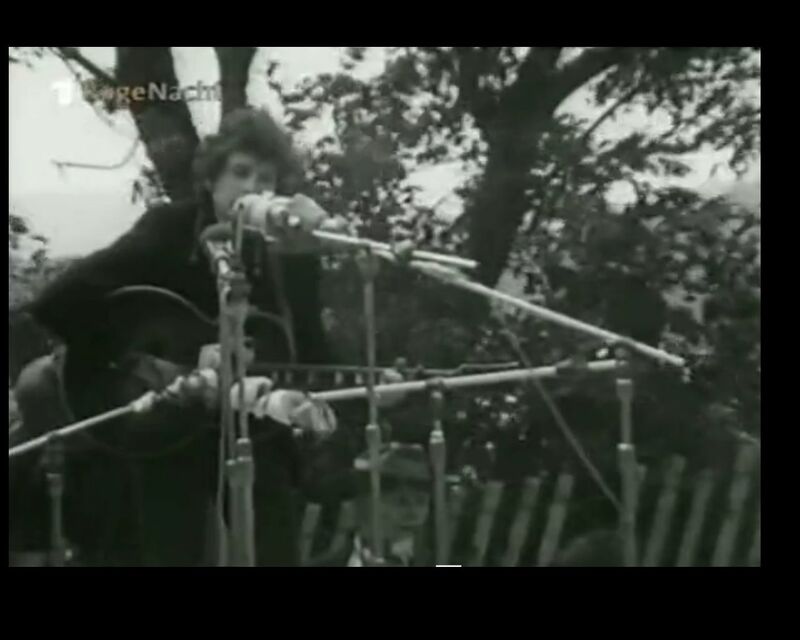 Look at these two shots - the first is from 'The Other Side Of The Mirror', right as Dylan is starting 'If You Gotta Go, Go Now'. 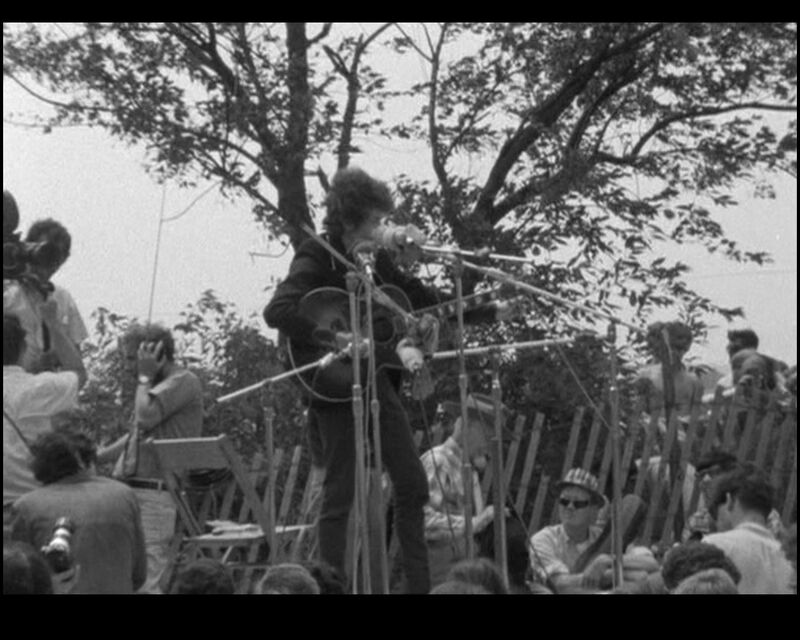 Notice the man with the destinctive white beard and hat standing up to the left of Bob Dylan. He has his jacket in his hand. You can see in later frames that he appears to place the jacket over the chair behind him and sits back down. 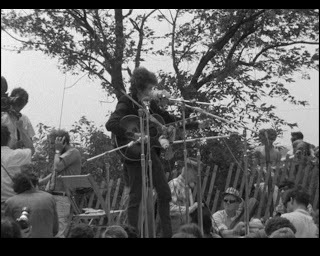 The same individual can be seem to Bob's left, but he appears to have his jacket on. Also, if this isn't Murray Lerner's footage, then both cameras/cameramen were at least in very close proximity and recording from the same angle. At first I was going to argue that the bearded gentleman might just as easily have been putting his jacket on at the start of If You Gotta Go, Go Now. However, the next frame in "The Other Side Of The Mirror" *does* seem more consistent with his lifting and placing a jacket over the back of his chair rather than putting the jacket on himself (note: we can barely see the position of the bearded guy's hands on the jacket at bottom right of the screen). As the If You Gotta Go, Go Now screen opens, the bearded guy is visible standing with jacket in hand. But we don't actually see him stand up from a sitting position. How do we know that he didn't just arrive? Yet, from what is shown in subsequent frames, it is logical to assume that he does place the jacket over the back of his chair and then sits down. It's hard to tell, but to me, it also looks as if the bearded guy does have his dark jacket on (or it's around his shoulders) during the Tombstone Blues clip. I do say nice detective work! But wait! What if, If You Gotta Go was at the very start of Bob's set when the bearded guy arrives with jacket off, and he then places it on the back of his chair? He has his jacket off during that song and one or two others, but at some intervening point (which we don’t see), he slips it back on *before* he's shown wearing it during Tombstone Blues? It was a very windy day, probably not chilly, but under a shade tree, who knows how the wind blows for an old guy? Since the bearded guy is not shown in any of the other circulating footage besides these two clips, I'm not sure at this point we can say with certainty which was first - Tombstone Blues or If You Gotta Go, Go Now. Probably, it's more than 50 - 50 one way or the other, but not as high as 99.9% for either. Fascinating but I am not sure how it helps any of us; clearly, if Tombstone Blues was played Learner (or Dylan or his management) decided at some time that it was not for public consumption. Hence its none appearance in 'Mirror' which claimed to be a history of Bob's performances at Newport. I thot also that there was another performance we have on tape/audio which is not ion the DVD either. Still, thanks for the time and trouble you have taken to show us this ... cheers!